A sous vide poached egg is a perfect, creamy egg. It is one you will not forget. 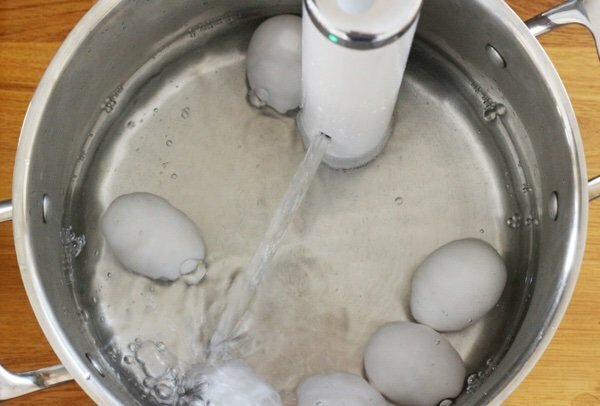 In case you are wondering what “sous vide” is – you probably missed my post on Starbucks Sous Vide Egg Bites. Sous-vide is a method of cooking food. You place the food in a is sealed in a sealed plastic pouch then a hot water bath for a long time. The idea is that your food is cooked evenly. The inside is properly cooked without overcooking the outside so you retain moisture. What this means for eggs is that the yolk and the white are the same creamy texture – and they are pretty special. How do you cook sous vide at home? You have to purchase a sous vide cooker ($180-$200). Mine is called a Joule (see below) but there is another home sous vide cooker called Anova. Joule sent me a unit for testing and I must say that it worked brilliantly. All the Joule does is heat water and keep it at a steady temperature for however long you want it to be on. With a steak, you heat up the water, put the steak in a ziplock bag, lower it into the water and leave it for an hour or more until it is done to your liking. Then, you sear it. 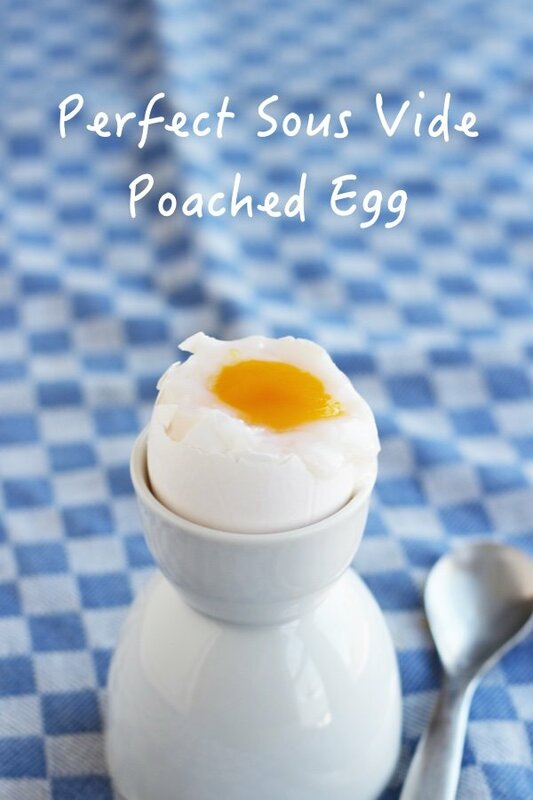 Eggs are even simpler as they come encased in a shell. You put warm water into a pan (or a cooler) and then, using your phone, dial in the temperature that you want. 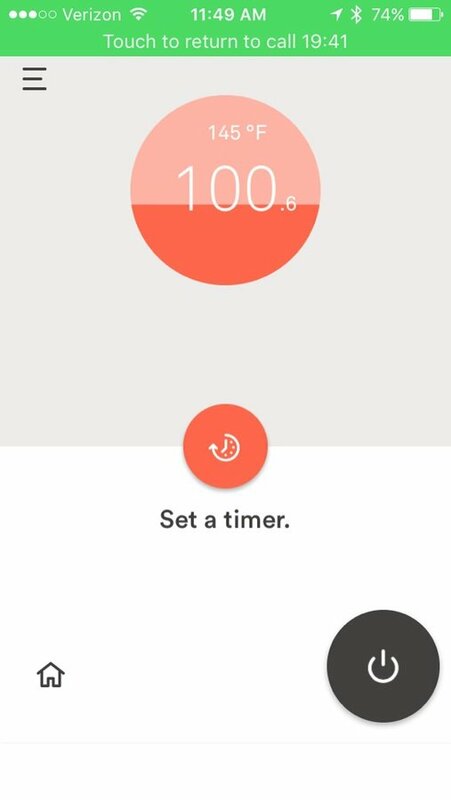 The Joule app works on any mobile device. For soft poached eggs, I dialed in 145 F because I wanted medium-set whites. For soft whites (143 F) and for firm-set whites dial in 147 F.
Then, you lower the eggs into the water and cook them for one hour. No, this is not a fast breakfast but it is a gourmet one. After you cook it for an hour, you can keep them warm for 2 hours at 140 F.
I served them in the shell but you can crack open the egg and pour it out into a bowl. Then you can serve it over toast, rice, or on a salad. If a sous vide cooker is too expensive, don’t worry! You can make my soft boiled eggs on the stove and they will be pretty good (but maybe not perfect). Sous vide cooking is for those who want to venture into the land of gourmet (and have the time to do so). I have enjoyed using mine on the weekends and I have to say that the food usually turns out juicy and different. I used the book "Sous Vide at Home" (see below) and it is very helpful as a tool to help you dive in. I will say that most of the recipes are far more complicated than the way I usually cook. Have you tried sous vide? What do you think? 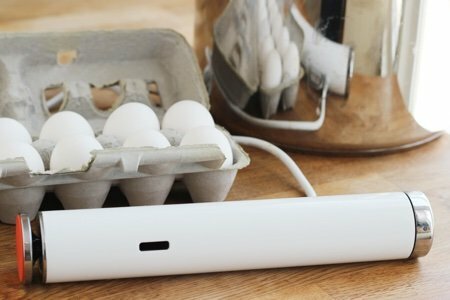 Starbucks Sous-Vide Egg Bites: A Solution to Breakfast on the Run? Lisa, Thank you for posting this, this morning. It actually clears things up for me. Keep doing what you do as I think we all learn different things from your site.